The e-Vermont Community Broadband Project worked with partner Digital Wish to implement 1:1 computing initiatives in 4th – 6th grades at schools in e-Vermont towns. 1:1 computing brings technology into the classroom in a way that lets every student have their own computer and Internet connection. Online resources become easily accessible for any classroom activity by all students at the same time. In the Digital Wish program, computers also went home with the students. Having the right equipment in a classroom is only one step in transforming the educational experience. Digital Wish follows a particular roadmap that integrates equipment, teacher training, and the broader community in ensuring that technology truly enhances educational goals. 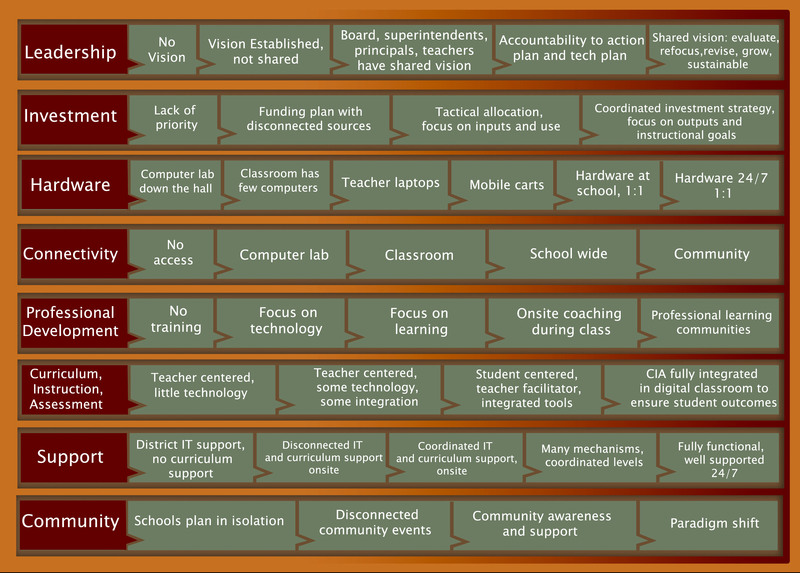 The strands of their initiative, and levels of progress along each strand, are shown on this chart. Click here for more ideas about integrating technology into the curriculum. For a sense of the difference this approach made in e-Vermont schools, check out these collected stories. Digital Wish is one example of a 1:1 computing initiative. The Anytime Anywhere Learning Foundation provides general resources and references for learning more about the ideas behind this approach. As part of e-Vermont, Digital Wish staff led over 3,000 educator trainings and worked directly in the classroom every week. A follow up survey found that in 80% of schools, teachers' use of technology continued to increase even after the year of intensive assistance ended.